With each day that passes in September, it is more noticeable that the hours of daylight are lessening for us here in the Pacific Northwest. At this point in my life, I no longer feel the pull of back-to-school time at the end of summer, nor the need for back-to-school clothes. Instead, I feel the excitement of wearing cozier layers, brought on by cooler autumn evenings. I am fully ready to bust out my autumn office attire! My plaid blazer is calling to me. Tweedy fabrics in my closet grab onto me in the morning. My booties whisper that they miss me. I luuurrve fall work wear. My summer office wear was fun, but I am so ready for fall. Some of my pieces from the hot months will stay at the front of my closet. Specifically, I have some work dresses from the summer that will layer over blouses, layer over tights and layer under blazers. Also, I have sleeveless shell tops and cap-sleeve blouses used in summertime that are well suited for underneath cardigans, blazers and other toppers. My office dress code is shirt-and-tie equivalent. I like to wear pencil skirts, ankle-length pants and men’s-style trousers with structured jackets and classically shaped cardigans. Currently, I am not so interested in wearing drape-y, waterfall-front cardigans for work. They’re just not as polished as I would like. A scarf tied at the neck…perfectly stylish in the fall. 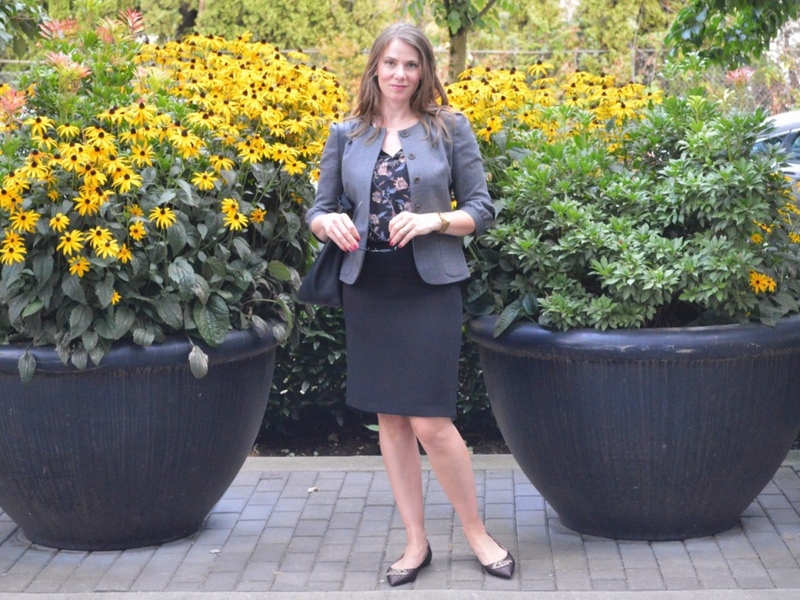 I am loving my oversized tweedy blazer, especially with a silky floral top. This floaty floral blouse has a soft ruffle at the sleeve. I appreciate its subtlety under my fall layers. This grey wool jacket has retro appeal, with puffed shoulders and buttoned 3/4 sleeves. And I love to wear flats with a pencil skirt! 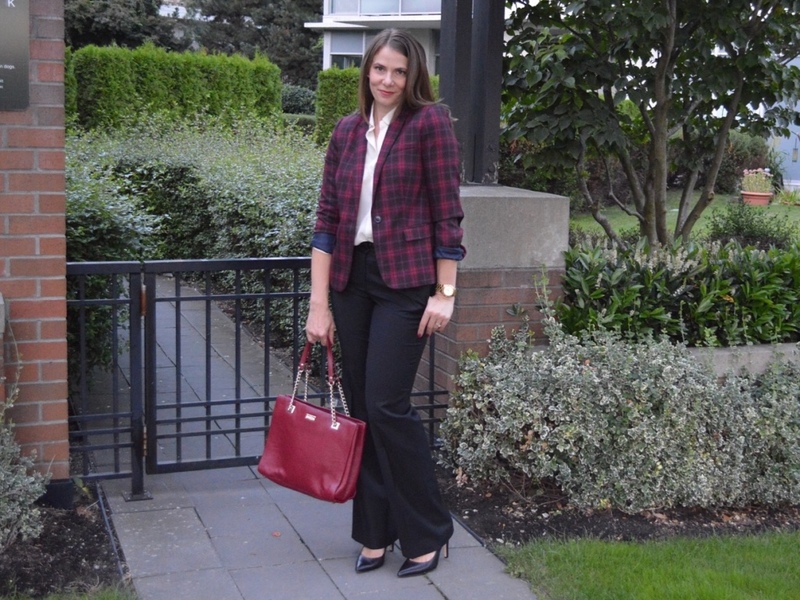 My burgundy plaid blazer is a standout piece that easily elevates basic black trousers and a simple cream silk button-up blouse. 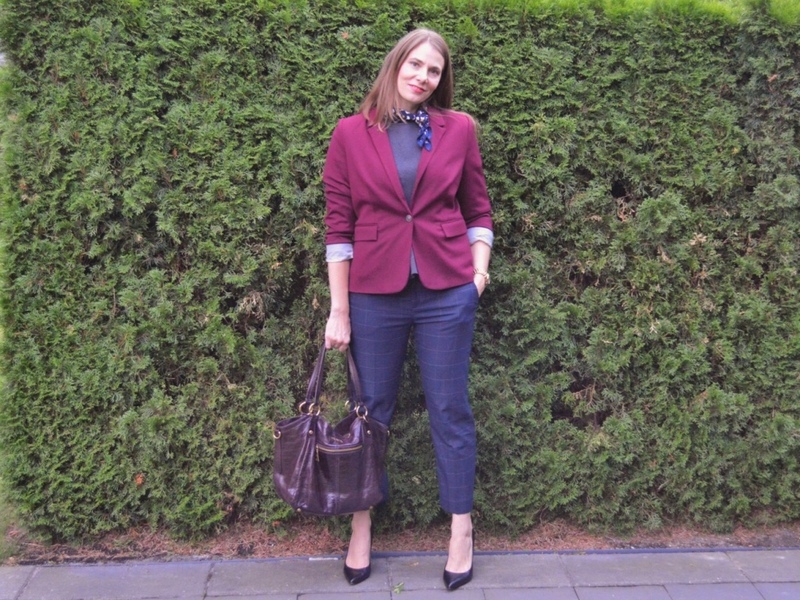 We completely enjoy helping you find your own office attire inspiration. We are here to help you build your work wardrobe that is suitable for your style, your dress code and your lifestyle. Contact us today and we will make it happen. Follow us on Instagram, Facebook, Twitter and Pinterest for more style inspiration.